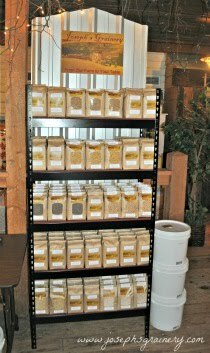 Joseph's Grainery: Stone Ground Flour - Here We Come! Stone Ground Flour - Here We Come! We're pretty excited around here. Why? Well, our brand new Meadows Mill just arrived and we're gearing up to offer you the very best Stone Ground Flour from the Palouse Region of Washington State. Join my Grandpa Bill as he unpacks the mill and gets it ready to start milling Joseph's Grainery Stone Ground Flours! From plow to package, we make sure your flour is the very best it can be. We grow the grains we mill, so you can be assured you're receiving premium quality whole grain and legume flours. Nothing is added and nothing is taken away - all of the good stuff is in the flour!